As a work from home mum my life is basically a big balancing act, juggling my work load, being a mother, being a wife and considering home life too. Most mornings consist of getting up, rushing to get my daughter her breakfast, into her uniform, getting myself ready and out the door before 8 am. A few hours to try and get some work done before going back to collect her from school which is followed by playing toys and making dinner just in time for the husband to walk in the door. So it comes as no surprise when I say that I am just too tired to make time for me. When it comes to hair, I'm a simple gal. I would love to make time for my hair every morning and create some of the cutest lustrous locks but in reality, that's never going to happen. I have a little one that is on a go slow every single weekday, making no time for me or my hair. So the school run mum bun is always the favourite. Cold, wet winter weather can take a toll on your hair. The most effective and practical way to protect your hair from the elements is to cover your head with a hat or scarf, but make sure that it’s not too tight, but let's be honest even then it can be bad for your hair. Limit the use of tools like hair dryers and curling tongs, as the heat can dry out your hair and scalp, increasing the risk of damage. It might be tempting in the colder months to turn the water temperature up, but try to avoid washing your hair in very hot water – use warm or cool water to avoid damage. As really hot water can dry out your hair and damage the delicate skin on your scalp, which may be extra sensitive during the winter. I have had a change up in my hair styling products and introduced a few new products from Design.ME. Design.ME is an innovative company that is leading the way with a new approach to hair care. The packaging is a solid pastel colour and each product is a different colour. This makes life a lot easier since they are bright and it’s very easy to pick out the product you want in the sea of other products in your arsenal. All of Design.ME products are Vegan, Gluten-Free, Cruelty-Free, Paraben-free, and Sulphate-Free. For me, the packaging was what stood out the most for me. All the different products come in a different pastel shade and I really adore pastel shades. Personally good packaging can obviously make a huge difference to products and sales, especially when they’re sitting there on a shelf with thousands of other products. You want yours to stand out and I’m certain that these would, if you were walking down the hair care aisle. It's all about the pastels! So today I wanted to share a couple of my current hair styling faves with you all. 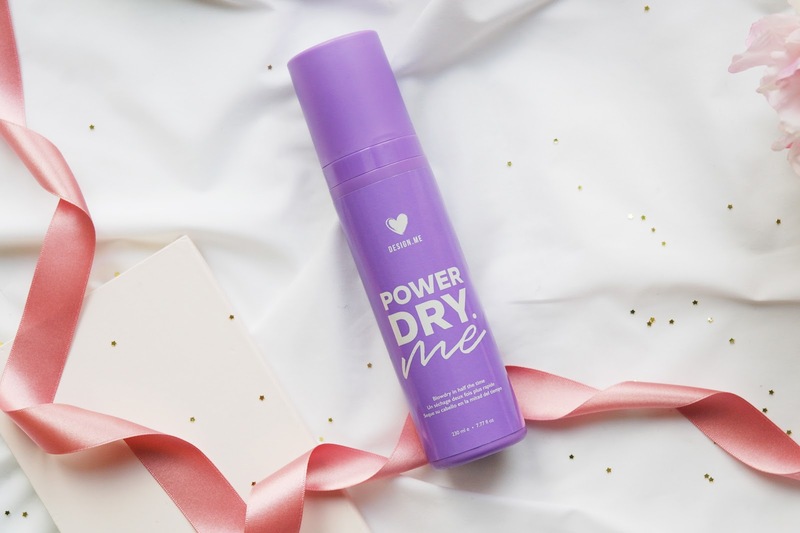 Powederdry.ME is a spray that you use when your hair is damp to cut down on blowdrying time. The formula uses microemulsion to form a thin layer on your hair fibers to give it better alignment. This allows you to blow dry your hair without having trapped water in the tangles in your hair. 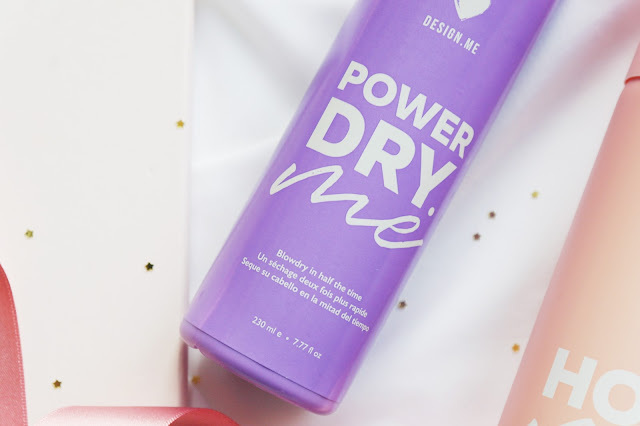 Design Me has created this product to cut down on the length of time it takes to blow-dry your hair by also causing the water to bead up on your hair. This causes a lot less heat damaged which is great for your hair and your time management! When I used this I also say my hair had a softer feel and looked healthier. I have to say that the Powderdry.ME really did cut down my blow drying time. I'm a girl with long hair, who has probably spent most of my life drying my hair, but this bottle of wonders has really helped cut that down. Not only does it save me some time it actually battles the frizz and boy do I have some frizz this time of year. Since using the Powderdry.ME I can really see a difference in the condition of my hair, it's a good one to add into your hair care routine. 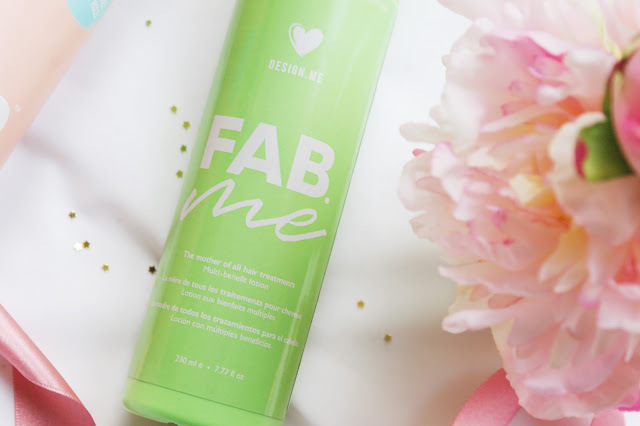 Fab.ME is like a spray in conditioner but also feels like a kind of treatment, and I can't say that I have ever come across a product like this before. It's a new one for me. You simply spritz on damp hair after washing. It basically does, well, everything. It controls frizz, detangles, strengthens, heat protects, hydrates and so much more. It's a great all rounder and if you are looking for a product that does everything, then this is the one for you. It's brilliant. It was quite a thick formula and smelled amazing, but not too heavily fragrant and it certainly stays on your hair long after you’d finished drying. The benefit just keep coming with this Fab.ME and it's definitely something that I will try and use twice a week to get all the benefits from the product. After a few uses this has left my hair feeling nourished, it looks healthy and it feels super silky and smooth. Not only that, but it has definitely helped my split ends. 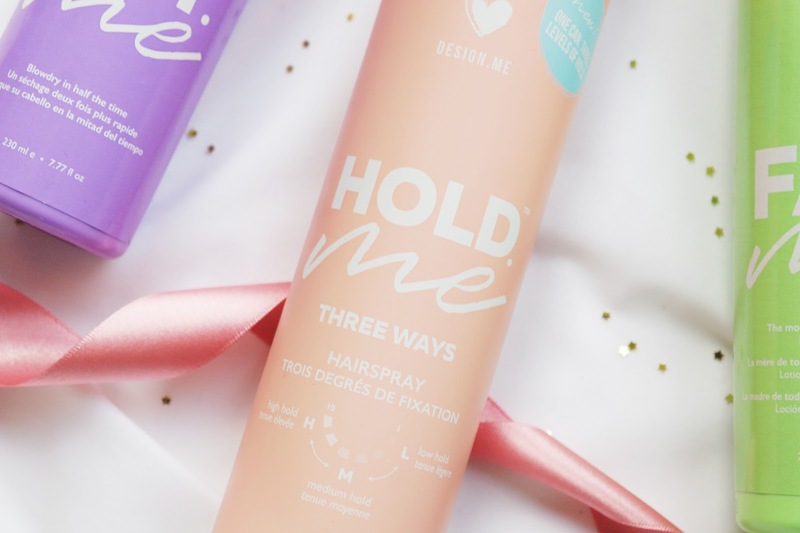 One hair product that I cannot be without is hairspray, and this Hold.ME hairspray brings three different holds of hairspray into one bottle. 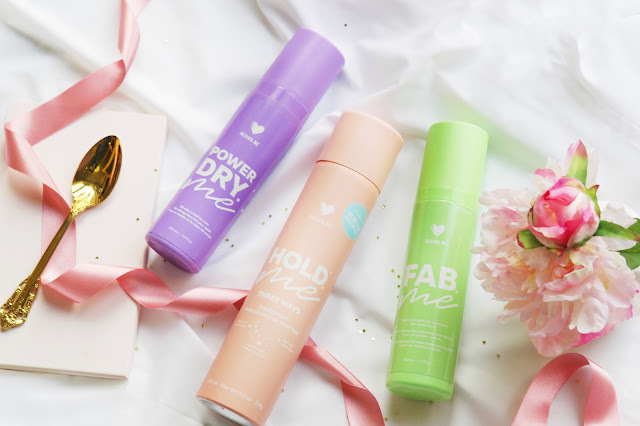 With just a little twist, you can modify the hold from light, medium, and strong.Hold.ME is a flake-free, vegan and cruelty-free formula that not only gives you shine and hold, but also offers UV protection from your hair straightners and curling wands. And this one smells amazing. It's definitely one you should try. Have you tried anything from Design.ME? Do you have any hair styling faves? 8 comments on "Current Hair Styling Faves"